One of the pieces of feedback from the Reader Survey was a request to have a place to make suggestions for subjects for future posts. So here it is. Add your comment at any time for a topic suggestion. There will be a slight makeover of the home page soon (related to other feedback from the survey), and a link to this post will live in the sidebar. New KBOO Bike Show Collective member Tori Bortman will host with Ayleen. They will interview Jonathan Maus from BikePortland.org, the world’s most popular bike blog. The Lake Oswego transit alternatives analysis hasn’t settled on a mode yet, but if Streetcar comes up as the winner, there are going to be some interesting choices for how to terminate the alignment. 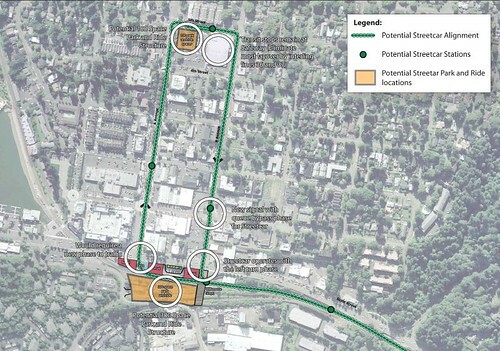 In any case, the Streetcar will help spur development in the Foothills district between Highway 43 and the Willamette. There are also plans for a modest park-and-ride in all the scenarios. The real question is where and how to use Streetcar to spur redevelopment in the existing core of the City. The cheap option would stop near where the current Willamette Shoreline trolley terminates. This wouldn’t do much for development in downtown. Going to Albertsons creates some redevelopment opportunity and also leaves open the potential for a later extension to West Linn. Going to Safeway perhaps does the most for downtown redevelopment but is also probably the most expensive and is out-of-direction for further extension to the south. As we’ve discussed, the staff recommendation (PDF, 1.8M) for the Environmental Impact Statement phase of the analysis of the Columbia River Crossing product is to look at two options (in addtion to the “no build” do nothing option which is required by Federal rules): Replacement Freeway Bridge with Light Rail and Replacement Freeway Bridge with Bus Rapid Transit. As we did for the last major narrowing exercise, Portland Transport will offer an online discussion of the options. Stay tuned. As I’ve discussed the need for a sustainable funding source, several people have inquired about what it costs to keep Portland Transport operating. So here’s the breakdown. We have recurring costs on both a monthly cycle and an annual cycle. There’s good news on the hosting front: reader John Beaston from Easystreet has indicated that Easystreet would be willing to provide complimentary hosting. Early in the new year we’ll be looking at the specs on their hosting package to make sure it matches up with our needs (which are pretty basic: Perl, PHP, MySQL). Feedburner provides enhanced RSS service and statistics for our our three RSS feeds: the main posts feed, the comments feed and the KBOO Bike Show podcast. Libsyn is a specialty hosting system for podcasts. The two big benefits are unlimited disk space (you pay by the amount you upload per month, not how much total content you have) and specialty statistics that make sense for podcasts. Site Meter provides basic stats for the site. We also have about $250 in annual costs, which include domain name registration (portlandtransport.com, tsrf.us), a Flickr account, a couple of state filing fees required for non-profits and about $100 for legal services related to our non-profit status. So taking out the hosting costs and amortizing the annual expenses, that works out to about $45/mo to keep Portland Transport running. I really hope that Portland Transport is bigger than just one person, and I also hope that someday I’m not necessarily the driving force. A non-profit provides a structure that allows for succession. If we take the transit tools much further, having a non-profit structure to own the intellectual property is a good thing. The feedback from the survey was useful in terms of validating that minimally intrusive ads or sponsorships don’t give people a lot of heartburn. If anyone has other creative funding ideas, I’m all ears!